Featuring the work of three video-based artists,Unmeasuring Time charts the temporal links between video and performance, and between perception and documentation. Video can be observed as perpetual – they continue outside of the viewer’s experience. This temporal disconnect has afforded Kennedy, Clifford and Lane a space in which to sculpt time, a place that neither begins nor ends. Questions of truth and authenticity have plagued lens-based media since its advent. Traditionally the live and the mediatized have been understood as existing within a reductive binary. The live conventionally found in performance being understood as ‘real’ whilst the mediatized forms of video were reduced to being perceived as a supplementary reproduction. Each of these mediums is marked by a persistent presence and absence that evokes intimacy, immediacy and the ephemeral. The transiency of Performance can be understood through the phenomenological experience of presence and subsequent disappearance. Functioning similarly the mediatized image is simultaneously coming into being and disappearing through the shutter of a projector it is never completely present.1 The live and mediatized demonstrate an oscillating relationship, as they are dependent on one another, this bond between performer and technology is critically engaging. Video and performance inform and intersect with each other as mediums, undeniably entwined. The exposition of performative video engages the nexus between the live and the mediated, the tensions between the ephemeral and video’s multiplication of the times and spaces of performances in their simultaneity and presentness. Performative artists have adopted the video camera and screens extensively and in variegated ways. The intrinsic temporal nature of these mediums sets art in motion allowing it to be perceived as a durational experience. Eastern philosophy teaches that ‘Time is an illusion’ similarly Western philosophers follow that ‘Time is a human construct’.2 It is a phenomenon of human experience that is universal and democratising. 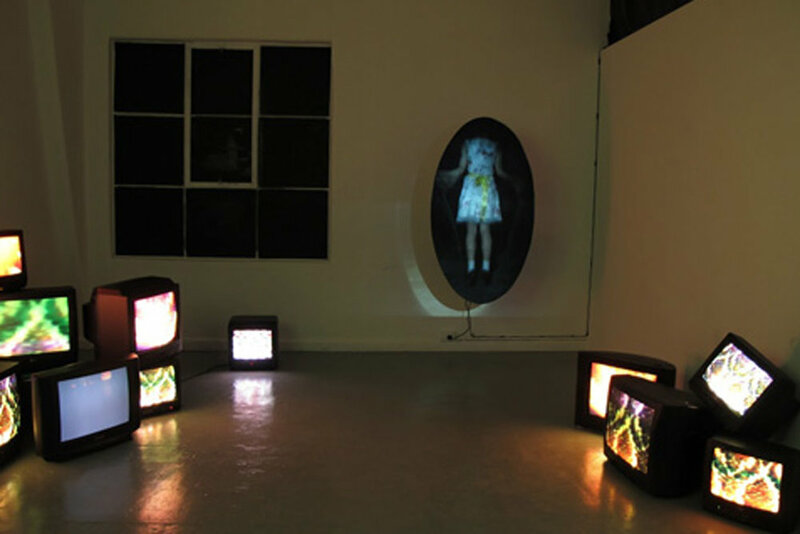 Time can be utilised as a material drawing on the charged relationship between screens and spectators generating multiple and even conflicting temporal impulses.3 Performative video provides a mode for sculpting time, operating to disrupt the dominant conventionalities demonstrated in the works exhibited in ‘Unmeasuring Time’ by means of visual and temporal subterfuge. Numerous female artists deploy the mediums of Performance and Video, as they have not traditionally excluded women. This exhibition showcases a group of divergent female practitioners, intimately illustrating a breadth of investigations from nostalgia to the abject. Each artist in this exhibition deals with durational experience uniquely from directly recording a live performance to utilising the relentlessness of continuous loops. Juxtaposing the video artworks in ‘Unmeasuring Time’ demonstrates differing approaches to time whilst elucidating videos ability to generate immersive temporal impulses. When a video is utilized to document a performance the camera can operate as a relatively non-obtrusive element this technique is adopted in Gina Clifford’s Composition (red). This artwork documents a recording of time (composed of two seamless shots), throughout the performance the camera remains stoically still. This demonstrates an appeal to authenticity through its linear approach to documentation. Zinzi Kennedy’s piece Chrominance elongates the perception of time creating an interior space. Drawing out an existential sense of reality through the use of empty visual space and the denigration of the materiality of video. Whilst Bonnie Lane explores repetition and rhythm through her transfixing imagery, this technique exemplifies a cycle of exhaustion and renewal. ‘Unmeasuring Time’ has infinite points of entry and exit ultimately illuminating the subjectivity of temporality.